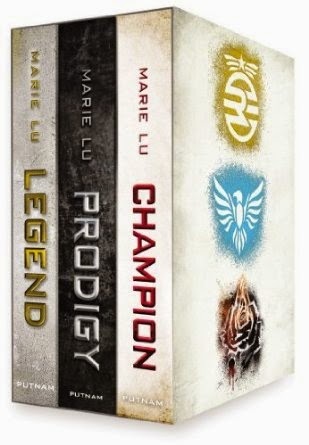 After reading The Young Elites, I knew I had to get my hands on Marie Lu's other books. She impressed me right away and I knew if her latest book was that good, her debut work was probably pretty great too. I was not disappointed. In truth, it took me a minute to get on board with the Legend Series, and the only reason was because I realized it was another dystopian along the same lines as The Hunger Games and Divergent. (I hadn't looked it up before picking them up) While I loved The Hunger Games, Divergent was more annoying to me than anything else and I guess it made me reluctant to jump on board too quickly. The Legend Series takes places in a post-apocalyptic America. Great floods came and left many of the states covered in water. Disaster induced chaos turned to the formation of two warring entities. The Republic and The Colonies. The main story takes place in The Republic. A place with corrupt government with a power hunger, terrible leader. The poor are mistreated, dismissed, starving or killed. The wealthy are trained hard to become soldiers in the battle with the colonies. Day is the Republic's most wanted criminal. He's a renegade, with the reputation of a phantom. Someone with the ability to scale walls in a second, melt into the shadows without a trace... he steals and destroys in bold face defiance of the Republic, who has taken so much from him. The entire series takes place alternating through the eyes of June and Day, and the different perspectives given you an in depth look at what it's like to live in the Republic from two completely different sets of eyes. It helps you understand the workings of the government and it's people as a wonderfully executed world building device. The story is fast paced, action packed, and really quite thrilling. What I loved about Lu is that right from the start she made it clear that none of her characters were safe from death, and she really kept you guessing who would survive and who would not. Generally, I enter most books knowing the main characters won't die, and if they do, it's super disappointing or annoying. In the Legend Series, since you understand so quickly that no one is safe, it actually makes the reading a page turning, on the edge of your seat kind of experience. There is great character growth, development, and change. I felt like Lu kept things from being too over the top in a way that made her characters awesome, but relatable. The romance in this book had many many stereotypical scenes and confrontations, which I plugged through just because I had to. ha. But overall, I liked the way it was done. I felt like the ending was well done too. All my questions were answered and it felt complete and satisfying. I read these one right after another and they flowed very well. I didn't think there was one book that was better than another, although the last book, Champion, had me in tears one moment, and flipping pages as fast as I could in other moments. It was seriously hard for me not to flip to the end to see what happened so I could deal with the crazy scenarios without wanting to explode. ha. The one thing that bothered me some times was how young they were. Day and June are both 15, and many of of the characters are quite young. They are doing such grown up things, I often forgot how young they were. Granted, June is a prodigy... but the ages just felt a little off to me. Other than than, I thought it was an excellent series that made me excited about dystopian novels again! They say that chocolate milk is one of the best drinks for a body after a good work out. There is so much physically demanding training and exercise going on in this series that you can't help but feel exhausted just reading it. You'll definitely need some chocolate milk after reading about the crazy stunts that happen in this series.